Sunday I took my first ambulance ride, with Ricky. We went from the soccer field to the ER. Just 20 minutes into the game, Ricky went up for a high kick trying to score and fell to the ground in pain. After 4 hours in the ER yesterday and another 4 hours today in the orthopedist office, the tentative diagnosis, pending an MRI, is a dislocated patella and torn meniscus. We won't know if surgery is required until after the MRI, but physical therapy is starting tomorrow. Meanwhile, he's wearing a brace that keeps his right knee immobile. Ricky was in a lot of pain, so much so that he was dripping with sweat, until the EMTs gave him some painkillers intravenously. While he rated the pain a 9 instead of a 10 after the meds kicked in, he started talking loudly non-stop instead of gasping for breath. He asked the EMT when the painkillers were going to work and the EMT just smiled and said, "Keep talking, Ricky." In the ER, Ricky took over answering the questions in a very loud authoritative voice and then fell asleep. I just hope we discover the injury is minor and he is not afflicted with knee problems throughout his adult life. He's more concerned about the delay in getting his driver's license and dancing at the prom in several weeks. Last evening, we planted 9 tulip poplars, Indiana's state tree, by our creek bank and one Buckeye, Ohio's state tree. I didn't mind the rain today, thinking of these trees settling into their new home. I just hope the wire cages keep the bunnies and deer away. All the trees were second year seedlings that I potted last year after weeding them from the garden at the site. Saturday was a volunteer work day in the gardens at Gene Stratton-Porter. I asked my sister to cook lunch for the volunteers and she worked hard to prepare two types of quiche, fresh fruit tray, baguettes, and fresh cookies. After fighting with the Star of Bethlehem, it was nice to come into this lunch. We have an older gent who works under a Federal retraining program at the site. Not much call for bear-baiters now, one of his previous jobs while he lived in Canada. After lunch, he asked my boss, "What was dat we ate for lunch? It was goo-ud, but what was it? I looked around for a main dish, a samwich or sumpin, but then I thought it was a dessert lunch, so's I got me a piece a pie. But it wasn't really pie." 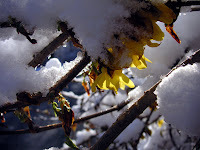 Here it is the 15th of the month again and time for Garden Bloggers to post what's blooming. I woke up to 3 inches of snow and it looked like the whole world was blooming. After church, though, the sun had come out and I actually found some blooms. An honest-to-goodness snowball bush. 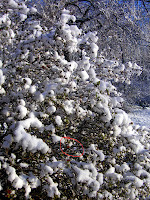 Note the bud I circled on this viburnum carlessi. 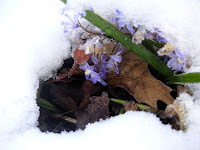 An unknown bulb pushing through the snow. A few hours later the sun came out and this was the surprise bloom for today--a species tulip called Persian Pearl. 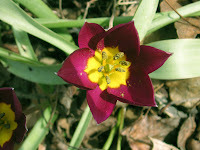 I love this diminutive flower and plan on planting more species tulips. 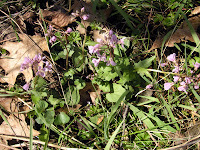 And I found a few flowers blooming in the woods, including several large stands of purple cress, so named because the underside of the leaves are purple. After posting about the beauty of the moment, how can I complain about the large, wet snowflakes falling tonight? No moon, no stars, but yet the night is bright. This is the first photo I took tonight on the road leading to our home. I set the camera for night but forgot to turn off the flash. 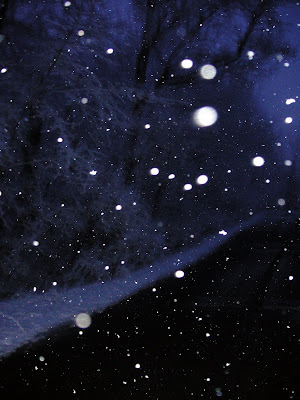 The flash caught the large flakes slowly falling, but the snow-covered woods behind remained illuminated as I saw it. I may have been predisposed to see beauty because we were coming home from buying new pendant lights for my kitchen. Experiencing the beauty of the moment is natural to a child. One of a child's greatest gifts to the parents is learning how to observe beauty in the world through the child's eyes. When I moved from the city to the country, in a wooded canyon, I prayed that I would never ignore the setting. My prayer was answered, even more now that I'm not involved in a high-stress career. That leads me to this incredible story. "Joshua Bell is one of the world's greatest violinists. His instrument of choice is a multimillion-dollar Stradivarius. If he played it for spare change, incognito, outside a bustling Metro stop in Washington, would anyone notice?" Thank to Lucy for pointing me to the story. Today is our 15th wedding anniversary. As a favor to our wedding guests, we gave them white pine seedlings, about 6 inches tall. 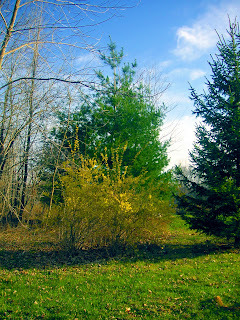 Here is one of the white pines today, behind the scraggly forsythia. It may be about 40 feet tall. Our love has grown in the same amazing way. For about five years, Ricky has wanted to go to Florida for Spring Break. This year we finally gave him permission to go on the Campus Life trip to Vero Beach. He left Friday night and will be back next Saturday. Friday morning I woke him by telling him that this was the last morning for over a week that he would wake-up in his bed. With his eyes still closed, a grin slowly appeared. We spent the day buying some last minute items and packing. Here he is taking his bags to the car. When I dropped him off and he finished the paperwork, he came back to the car, looked at me intently and gave me the biggest and longest hug ever. Then we talked and I gave him a big old hug again. And then he stood there for a while. How much he wanted to leave and to stay. I checked the temperatures at these two spring break locations: Florida - 79 degrees and sunny all week. Detroit (where I will be) - 34 to 40 degrees and snow on Wednesday and Thursday.